FreeSpirit Block Party Autographed book auction! I’m sitting in my hotel room here in Houston filled with inspiration from everything I saw at Quilt Market! Our industry is amazing and so inspiring! So many stunning quilts, meeting wonderful designers and artists, and finding new projects, tools, and connections. Quilters are giving people. We buy fabric, cut it up, and make something to give with our hearts. Let’s continue to give back, this time to Project Night Night. Project Night Night is an organization in San Francisco that helps homeless children have sweeter dreams. Their organization donates a package to children of a book, blanket, and stuffed toy. When I learned FreeSpirit Fabrics was donating portions of their proceeds to this organization, I knew this book needed to be shown to our quilty world to help their organization. Then I thought bigger. What if I was able to get our favorite designers autographs and auction off the book for Project Night Night? That was a goal of mine while attending Houston Quilt Market. Let’s help this wonderful organization by giving back and in turn, receive a fantastic book of block designs by our favorite designers. I collected 7 autographs here at Quilt Market and will be auctioning off the book this weekend, November 9th-11th, 2018. The auction will be live on my Instagram and hope all our quilty friends will share! The more quilters involved, the more Project Night Night will receive. 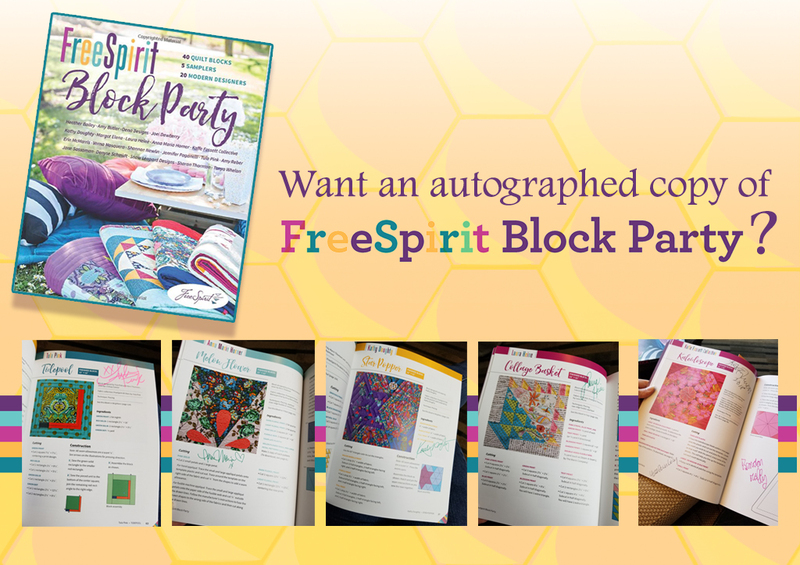 The FreeSpirit Block Party Book is signed by Kaffe Fassett, Brandon Mably, Liza Lucy, Anna Maria Horner, Laura Heine, Tula Pink, Kathy Doughty, and book co-compiler Nancy Jewell of FreeSpirit Fabrics. The auction will go live Friday night and close Sunday at 5pm EST. I will cover shipping of the book to the highest bidder. Please share with your quilty friends so this organization has a chance to receive the best donation possible. Remember this is for charity! If you want to donate directly to Project Night Night, please do so here. UPDATE: We raised $50 for Project Night Night! Thanks everyone!! http://handmade3d.me/wp-content/uploads/2018/11/FSBPB-Autographs.jpg 723 1024 handmade3D http://handmade3d.me/wp-content/uploads/2018/10/rectangleLogo-300x121.png handmade3D2018-11-06 20:54:272018-11-29 01:08:51FreeSpirit Block Party Autographed book auction!